You can customise the properties for any slide in your course, including how it advances, what happens when learners revisit it, and which player controls are visible. Select the slide(s) you want to modify, then use the Slide Properties panel in the lower right corner of the screen to make your adjustments. Click the gear icon on the base layer in the Slide Layers panel, or right-click the slide and choose Properties. Select a slide, then use the Slide Properties panel in the lower right corner of the screen to make your adjustments. Tip: When you import slides from PowerPoint, Storyline will respect the advance behavior from Articulate Presenter. Use this option if you want the slide to always remember its previous state. In other words, this lets learners pick up where they left off if they return to the same slide later. Use this option if you want the slide to always reset to its initial state when learners return to it. It'll restart from the beginning of its timeline, and interactive objects will return to their initial states. If the slide has only simple objects and/or audio but no interactivity, Storyline resets the slide to the beginning of its timeline. 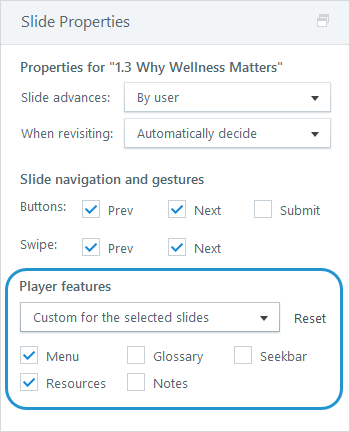 If the slide contains interactive elements, such as buttons or other objects that have a visited/selected state, Storyline resumes the slide where it left off previously. The result slide property is only visible for question slides. It lets you choose which result slide (if you have more than one) will report the score for the selected question slide(s). If your course doesn't have any result slides yet, see this user guide to learn how to add them. Mark the boxes for the navigation buttons you want to show on the selected slide(s). By default, content slides have Prev and Next buttons, while question slides have Submit buttons. Tip: To submit a learner's quiz responses all at once and provide feedback only at the end of the quiz, change question slides to Prev/Next buttons rather than Submit buttons. Also, mark the next and previous swipe boxes if you want to enable HTML5 gestures for moving between slides on touchscreen devices. You can choose any combination of navigation buttons and/or HTML5 gestures for each slide in your course. 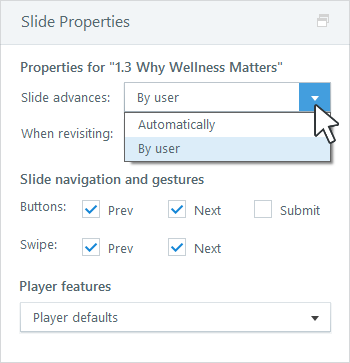 By default, each slide will show the features you enabled in the course player, but you can customize the player features on a slide-by-slide basis. Just choose Custom for the selected slides from the Player features drop-down, then mark the boxes for the features you want to show. To change the default player features for your entire project, go to the Home tab on the ribbon, click Player, and make your selections. Learn more about choosing player features.